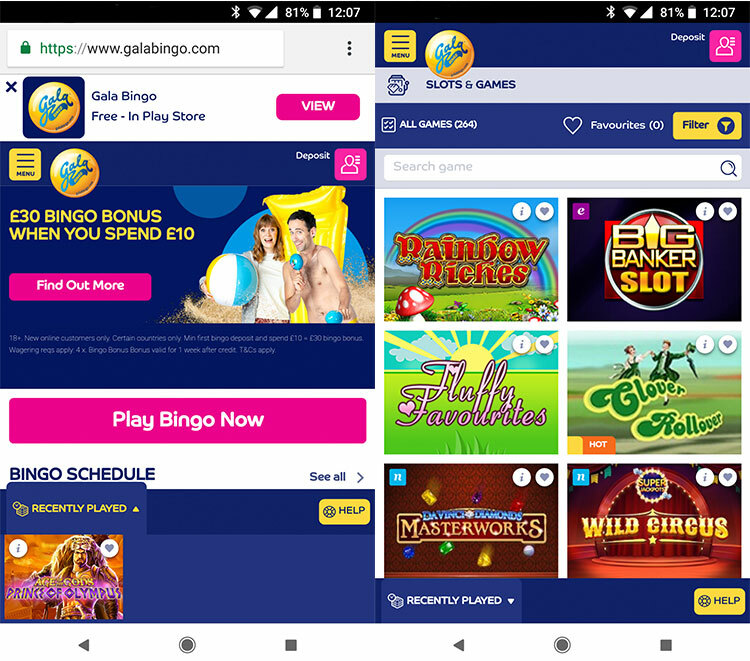 Gala Bingo Review (2019) -- A Good Casino Site or NOT? Read Our Verdict! 18+. New online customers only. Certain countries only. Min first deposit and spend £10 on casino slots = £30 Casino Slot Bonus & 15 Free Spins on selected games. Free Spins valued at £0.25 No Wagering. Wagering reqs apply: 20 x Casino Slot Bonus. Bonus valid for 1 week after credit. T&Cs apply. Gala Bingo is a well-known bingo operator in Great Britain with over 143 clubs. However, Gala Bingo online is less familiar to people. Of course, Gala Bingo slots & casino hasn’t been available online that long as the physical locations. Their online casino was established as “late” as 2006. Gala Bingo slots are from known software providers such as Amaya, Ash, Openbet, Quickspin, WMS, Openbet, IGT with more possibly added in the selection. Casino Professor is happy to announce that the casino bonus offered by Gala Bingo may be short but sweet. Well, there is a pair of numbers that you rarely see together! Here you only have to deposit as little as 10 pounds in order to pound the slots and other games with 30 pounds! Although some of the more experienced and hungry casino players might not see this as a big deal, we certainly think that this is a phenomenal low-threshold bonus. Just think about it: you only have to risk a tenner to spend a nice evening with some of your favourite games! N/A – No bonus codes are needed at Gala Bingo. Alongside the £30 Gala Bingo bonus boost will be 15 free spins. This also arrives as part of the welcome package once you’ve depoisted and wagered £10. Gala Bingo’s free spins are available for a range of games. Of course, these are subject to change, but at the time the Professor launched this Gala Bingo review, some of the slots included were Age of the Gods (multiple variations), Batman vs Superman, Frankie Dettori’s Sporting Legend and more. Best of all, any winnings from the free spins will come with no wagering requirements! Wagering requirements of x20 apply for the casino bonus. The Professor appreciates the fact that Gala Bingo has stuck to pretty much your usual bonus terms and conditions. When you deposit 10 pounds and receive 30 pounds of playing money, your wagering requirement will be £600. This is actually quite a small wagering requirement, which could easily be fulfilled if you managed to have some luck with your playing money. The same goes for most bonuses though—the less bonus money that you deposit, the easier it usually is to complete your wagering. There are plenty of payment methods that you can use at Gala Bingo. These include Visa, Mastercard, Maestro, Solo, Ukash, Neteller, Paysafecard and more. Even PayPal is available here, which is rather rare. Gala Bingo isn’t just a one-horse farm offering only bingo, regardless of their name. They also offer a bunch of slots, jackpots, table games and even a live casino to keep you entertained. Of course, their focus is bingo, like you probably already know. You’ll get to play Gala Bingo slots from Amaya, Ash, Openbet, Quickspin, WMS, Openbet, IGT with more possibly added in the selection soon. Gala Bingo Online has a pretty nice mobile version. For optimal mobile experience, there is an app available for both Android and iOs. Availability of the application may vary between countries. While using the mobile version is smooth on apps and browser, the game selection could be a bit bigger. At the moment there are 264 games available on mobile, which is somewhat low. Of course, the game selection isn’t that massive on the desktop either. Gala Bingo’s long tenure in the business really speaks for itself when security and safety are concerned. Even the most skeptical of internet users should have no problem believing that this casino is 100% genuine and authentic in what they do. And as a matter of fact, independent audits have proven that they operate in a fair manner. One sign of trust is also in the payment methods. Gala Bingo has managed to co-operate with PayPal, which is a somewhat rare sight in the online gambling. Though it is probably the biggest and most popular payment processor online. The fact just is that PayPal is very selective in gambling with whom it chooses to do business with. Gala Bing Online has licenses from the UK Gambling Commission as well as Gibraltar. Gala Bingo is not open for business in a lot of countries, which is why we have decided to list all the countries whose residents are allowed to play here instead of listing the opposite. If you reside in one of the following countries, Gala Bingo welcomes you with open arms: United Kingdom, Argentina, Belarus, Croatia, Georgia, Gibraltar, Guernsey, Iceland, Isle of Man, Jersey, Liechtenstein, Luxembourg, Macedonia, Malta, Netherlands, New Zealand, Republic of Ireland, Saint Kitts and Nevis, San Marino, Slovakia, Slovenia and Sweden. Gala Bingo is a stellar online casino, although their real strong suite is of course bingo, where they have won many awards over the years. Even so, they have countless slots, jackpot games, table games and even live casino games here to tickle your fancy. They have games from at least Amaya, Ash Gaming, WMS, Openbet and IGT. While this might not sound like a lot, is is still something and certainly enough for most land-based casino fans. For instance, IGT games such as Golden Egypt are rather popular at the so-called brick-and-mortar casinos around the world. Remember to write your own Gala Bingo review below after taking advantage of their attractive welcome package above. Not all the slots available that I usually like to play. On mobile, the selection is quite average or maybe even slightly below average thought the interface indeed is good. Did not try the app. Good to hear from you, Slotsmaister. It’s true that the Gala Bingo casino bonus isn’t massive, but some players actually prefer smaller offers as they (generally) mean lower wagering. But if you’re after something bigger, take a look at our huge casino bonuses for something more up your street!